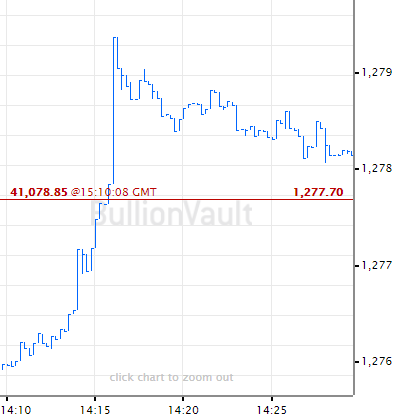 GOLD PRICES gained Monday morning in London, touching new Dollar highs for the month as Friday's stockmarket sell-off on Wall Street rolled into Asia and Europe after investors sought safety in major government bonds, writes Atsuko Whitehouse at BullionVault. 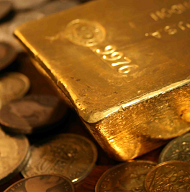 Silver and platinum prices beat gold's 0.5% price rise to add 0.8% and 0.6% respectively at $15.55 and $832 per ounce. Continued strength in bond prices held the yield offered to new buyers down near Friday's multi-year lows on developed-world debt from Australia to Germany. 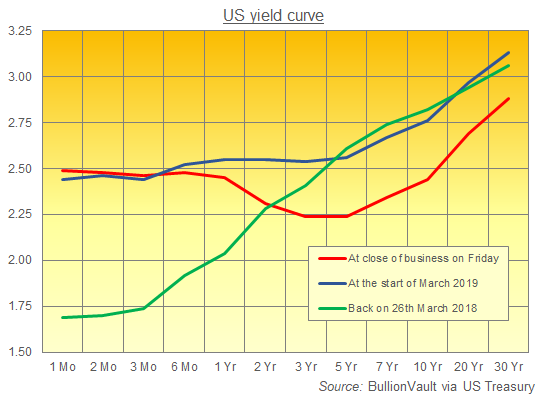 US Treasury yields stabilized however as the US Dollar Index – which gauges the greenback against a basket of other major currencies – slipped 0.2% in the wake of last week's yield-curve inversion, when the rate offered by 10-year Treasury bonds fell below 3-month T-bill rates. The gap between 3-month and 10-year rates is the most reliable signal of future recession, according to researchers at the San Francisco Fed. Inversions of that spread – where the annualized rate on 90-day loans beats the annual rate on 10-yeat debt – have preceded each of the past seven recessions according to the Cleveland Fed. After the US Federal Reserve last week cut its economic outlook and manufacturing survey data from Germany showed no pause in the sector's contraction, "The [gold price] has continued to rise in response to the continued worries that we have seen creeping in the market about recessionary risks," reckons analyst Ole Hansen at spread-betting bookmarkers Saxo Bank. After rising for 3 weeks running, gold prices rose another 0.5% ahead of the US open on Monday to edge above $1320 per ounce. 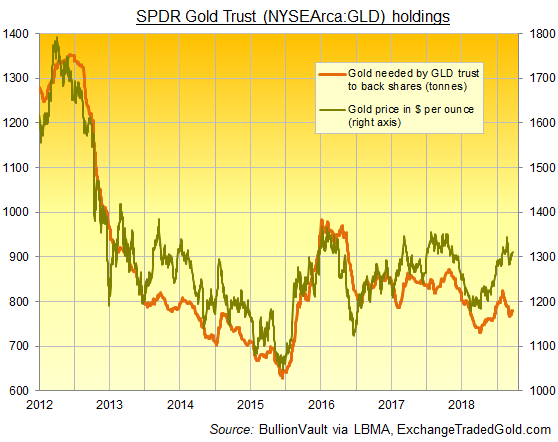 Among gold-backed ETF products, investors grew the size of the giant SPDR Gold Trust (NYSEArca: GLD) by 0.4% on Friday, recording a second week of growth. Data from US regulator the CFTC meantime said late Friday that speculators in Comex gold futures and options increased their bullish betting ahead of last Wednesday's US Fed decision to signal that short-term interest rates have now peaked. "Speculative financial investors are also likely to continue betting on rising gold prices," reckon analysts at German bank Commerzbank, "having already stepped up their net long positions. 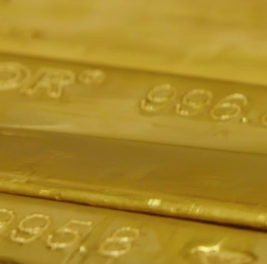 "This further paves the way for gold as it continues on its upswing." European stocks slid early Monday following Asia's lead as the Nikkei 225 in Tokyo lost 3.1%, its biggest one-day percentage drop of 2019 to date. Japan's 10-year bond yield meantime fell further, testing the September 2016 low at -0.1% while Australia's 5-year bond yield recorded an all-time low Monday morning. Gold prices for Eurozone investors edged up only to €1165 per ounce as the single currency bounced following a less downbeat survey of German business sentiment. 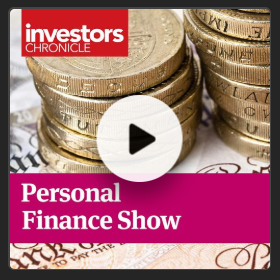 Gold prices for UK investors meantime traded around the £1000 mark as the Pound fell yet again with fresh political chaos over Brexit predicted for this week. After an estimated 600,000 people marched to demand a second referendum on Saturday, Prime Minister Theresa May failed to get backing from 'Brexiteer' members of her Conservative Party on Sunday, and called an emergency cabinet meeting Monday morning amid continued speculation that she will resign. US President Donald Trump meantime claimed early Monday that he has been "completely exonerated" of wrong-doing in his 2016 election campaign by the Robert Mueller inquiry into Russian interference in the vote. For Trump's ongoing trade talks with Beijing, "The Mueller report isn't a game changer, but it should encourage China to keep up recent momentum in trying to finalize a deal with Trump," reckons Michael Hirson, Asia director at consulting firm Eurasia Group. US Trade Representative Robert Lighthizer and Treasury Secretary Steven Mnuchin will visit Beijing for more trade talks on Thursday, with a Chinese delegation returning to Washington next week.